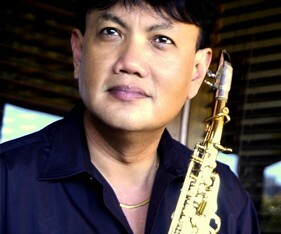 Andrew Oh is an international multi instrumentalist, specialising in Saxophones and Flutes. His style of music ranges from Cool Jazz with a heavy Influence of Soul & Blues. He is originally from Singapore but has toured all the over the world to promote his brand of music and CDs. His albums have received rave reviews in Australia, America & Europe and still enjoy constant airplay around the world. Since his arrival to Australia 20 years ago, Andrew has toured and recorded with Australian artists such as Tommy Emmanuel, Margaret Urlich, Marcia Hines, Daryl Braithwaite, Grace Knight, Rick Price, Glen Shorock and many others. Andrew also supported many international artists such as Al Jarreau, The Supremes, Thelma Houston, John Denver, Elaine Paige, Patrizio Buanne and Josh Groban. Andrew Oh and his band OHZONE are ideal for festivals, concerts, clubs, weddings, company functions and events that require a touch of funky sophistication. Andrew can perform Solo with backing tracks, as a Duo with a pianist, as a Trio with added Bass or any other configuration depending on the requirements of the event and budget.